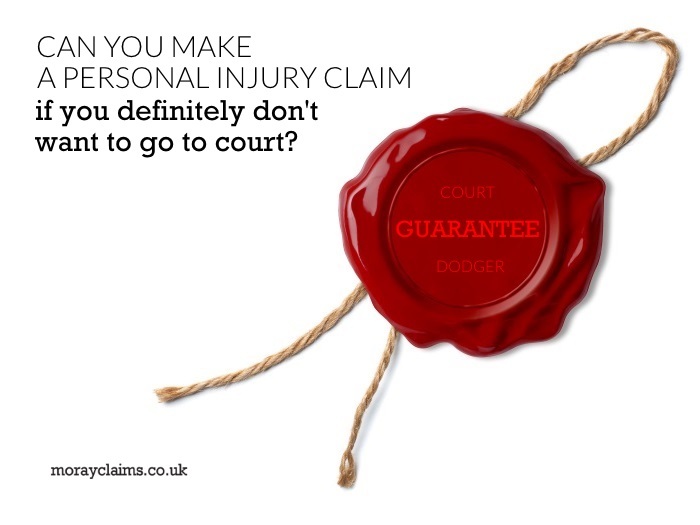 Can You Make A Personal Injury Claim If You Definitely Don't Want To Go To Court? You are here: Home / FAQs / Can you make a personal injury claim if you definitely don’t want to go to court? Can you make a personal injury claim if you definitely don’t want to go to court? Tilley hats might be the best in the world. They’ve been called “legendary” and “iconic”. Tilley hats float and, if lost or stolen, can be replaced for half their full purchase price. Should the hat wear out due to normal wear and tear, poor workmanship or faulty material, it will be repaired or replaced free of charge. Tilley hats are guaranteed for life. In 2013, a Guardian reader reported that, when the fabric of their hat split after 17 years, Tilley still honoured the lifetime guarantee and replaced it. They’re expensive hats but the various risk-reversal elements clearly help keep them desirable purchases. A guarantee can make a big difference to how likely we are to choose a product or service. In the context of personal injury compensation claims, not everyone wants to have their day in court. On the other hand, in another article on this website, we’ve considered the pros and cons for those who want a guarantee that their personal injury claim’s outcome will be determined by a judge. In our experience, however, most people would prefer their claim to settle without them having to give evidence in court. The purpose of this article is consider whether it is possible to guarantee someone that, if they proceed with a personal injury claim, they won’t have to go to court to give evidence. We’ll consider three questions. Firstly, why do personal injury claims have to go to court at all? Secondly, if you need to raise a court action, does it follow that you will need to appear in court? And, finally, can you guarantee that a personal injury claimant won’t have to go to court? Personal injury claims have to go to court when a negotiated settlement cannot be agreed. This could be because it’s not accepted that there was any breach of duty or negligence which caused the injuries. That’s a dispute on liability. Another possibility is that (in addition, or separately) there’s no agreement about the value of the claim. This could be due to dispute about the nature and extent of the losses which stem from the injuries in the accident. If you suffered a back injury but your pre-accident medical history includes back problems, it’s common for the interaction between accident injuries and pre-existing degenerative conditions to be controversial. This could be due to allegations that you were partly to blame for the accident (contributory negligence) which you either don’t accept at all or at least to the percentage the other side says is reasonable. So, having noted these examples of factors which could mean your claim has to go to court, we move on to look at what “raising a court action” actually means. Raising a court action does not make it inevitable that you will have to appear in court. Above, we spoke about a negotiated settlement before a court action becomes necessary but negotiated settlements are still possible after a court action has been raised. If you raise a court action, any final hearing with evidence of witnesses (including yours, the injured person) will not be “next week”. It will be many weeks away. It varies from court to court but will probably be at least 6 months away. Attend a meeting with the other side with the specific aim of settling the case (failing which, at least narrowing the issues in dispute). Only a small minority of cases have to go to court at all. Of those, only a small minority end up at final hearing, with you having to give evidence. Can you guarantee a court “non-appearance”? There’s an element of “life is uncertain” in everything personal-injury-related and solicitors don’t like to guarantee anything. “100% certainty” is not terminology that comes easily to any lawyer. Subject to that – i.e. nothing ever being 100% guaranteeable – you can pretty much guarantee (95%-plus ?!) that you won’t have to go to court if you don’t want to, in a case where liability is admitted. If liability is in dispute, there’s always going to be the chance you will have to give evidence in court in support of your claim. So, if all that’s in dispute is how much your claim is worth, you ought to be able to get an offer out of the other side before you’re at the stage of the final hearing with witnesses. In a case where liability is accepted, you would expect a formal offer (a minute of tender) to come along before the final hearing. There’s a big risk you won’t maximise the value of your claim, if you’re not prepared to see your claim go to a court hearing, with you giving evidence, if necessary. You must always outwardly give the impression that you are ready and willing to have your case decided by a court hearing, no matter how determined you are that you’ll avoid that experience at all costs. This includes making sure all procedural stages in the court action are covered according to the official timetable. It also extends to going to all medical examinations arranged by your solicitors, as well as those organised by the the other side. Your solicitor won’t necessarily be telling the other side that you relish the prospect of giving evidence but we all have to do difficult things sometimes in order to do what is “right”. All you’re asking for is justice and a fair outcome. Personal injury claims have to go to court when a negotiated settlement cannot be agreed. This can be due to disputes on liability or quantum, or both. Nevertheless, even after a personal injury claim has gone to the stage of court action, it’s not too late for a negotiated settlement. If liability is in dispute, no one can guarantee you won’t require to give evidence in court. But, if it’s just the value of the claim that’s holding up settlement, the chances are that your solicitor can give you the “Court Dodger’s Guarantee” you crave. It may mean you get a lesser amount of money in settlement (compared to being willing to give evidence in court) and you need to keep the “no court appearance” plan between you and your solicitor – i.e. keep it under your hat (sorry). Maybe you would like to run your claim scenario past someone for reassurance that you can claim and probably not require to give evidence in court? You can contact either of the accredited specialist personal injury solicitors at Moray Claims / Grigor & Young LLP (Marie and Peter) on 01343 544077 or by sending us a Free Online Enquiry. All enquiries are at no charge and without obligation to take things further.